This page contains several mp4 movies of my aircraft and animations of the virtual aircraft I have modeled. In this latest update I have embedded all the movies on this page itself. To retain a good video quality a fast bit rate has been set for the movies. If you have a slow internet connection there may be pauses when playing the movies. 1. In the first movie I am flying the JT-5 autogyro over the islands of the Gulf of Finland 1973. This was originally a 16 mm movie filmed from a Cessna 150 flying alongside the JT-5. There was no sound, of course (it would be the Cessna sound anyway), but I got a JT-5 sound clip by e-mail from Seppo Vihavainen who presently owns the OH-XRK gyro built by Veikko Silvennoinen and his sons. 2. ATE-3 flying at Helsinki Malmi Airport 1968. A clip of a 16 mm film. 3. JT-8 virtual motorglider flying over Tervamäki farm where I was born in 1935. 4. JT-8 virtual motorglider making a barrel roll in a mountain canyon. FormZ-rendering and animation. Note the bumps in the flight path due to wind shear and turbulence. 5. 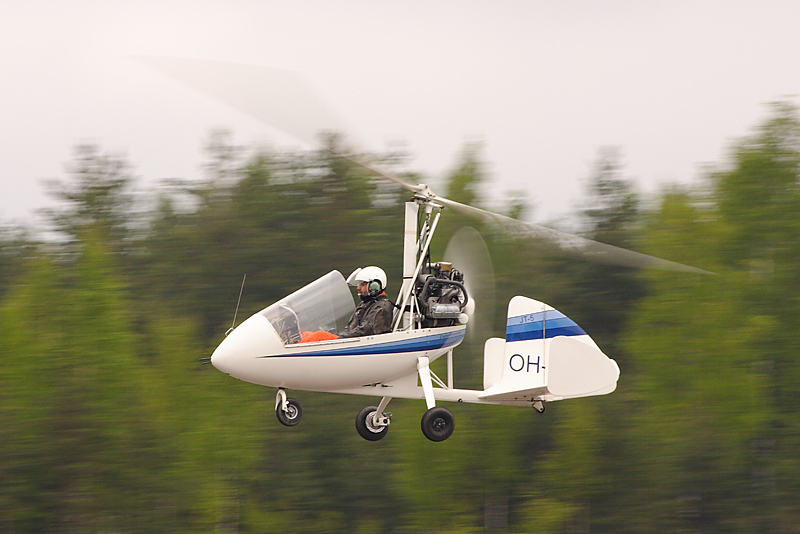 JT-9 autogyro fly-by over Malmi airport in Helsinki. This animation was made in May 2009 using the formZ 6.6 software. In addition to the aircraft the rotor and propeller were animated. Notice that the shadow of the aircraft also moves on the apron. 6. JT-11 autogyro flying over the Finnish lake country. FormZ rendering and animation. I have a lot of old 8 mm home movies of my autogyros and planes. I first decided to digitize a 20 minute 8 mm movie and 10 minute 16 mm movie of the JT-5 autogyro onto a CD ROM. I ordered this job from the TV channel 3 people in Helsinki and had to invest $ 100 for this job. All the 30 minutes of film was fitted onto a 600 Mb CD ROM in Mpeg1 format. Working with MacOS 9.1 at the time I next opened the CD Mpeg file in QuickEditor, trimmed the required seconds of movie and added sound which I had recorded in SoundMate or in the other recording programs. SoundMate is old and does not read or write all sound formats but is handy in editing sound tracks. You can cut, copy and paste sound pieces in a big window by seeing the wave form. QuickEditor offers the possibility to record and trim the sound, but no other manipulations. SoundApp is handy in converting sound to other formats. I finally saved the movie with sound in a reduced size for use on the net. Choosing the compression format was a problem since the various players in Mac and Windows do not read them all. Animations 3 and 6 were straight forward jobs in FormZ. Animation 4 required quite a bit more effort to create the barrel roll effect by animating the camera in a spiral fashion. Some bumps remained in the JT-8 flight path but they are only natural in a mountain canyon where wind shear and severe turbulence are common. Animation 5 required the biggest effort. Since FormZ at the time was not able to animate objects like rotor and propeller I had to rotate them manually frame by frame and render them one by one. It took a lot of hours and several days to render all 155 images of the movie. Animation 7 was my first job to use the new animation features of the formZ v 6 under MacOS 10.4 in my new Intel iMac. Rotor, propeller, camera and even the background picture was animated to get a realistic looking JT-11 flyby as if the cameraman would be in a hot air balloon zooming his video camera. HISTORY: I made my first QuickTime movies some 20 years ago when I had to prepare a training session for Labsystems service personnel from around the world. I connected a Mac IIfx to a digital projector and were able to show how various pipettor mechanisms work. Both the use QuickTime movies and the use of a digital projector connected to a computer were firsts in Labsystems history. If you have any comments on the movies and animations, please, send me e-mail!